The Lower Hatea River crossing in Whangarei, a new state of the art building at Middlemore hospital in Auckland and Wellington’s Clyde Quay Wharf were the gold winners at the 50th annual NZ INNOVATE awards, organised by ACENZ – the Association of Consulting and Engineering Professionals of New Zealand. The three projects received the top accolades ahead of twenty-five other finalists from across New Zealand. The annual INNOVATE NZ awards celebrate engineering excellence. Past winners include iconic sites such as the Britomart Transport Centre in Auckland, Wairakei Geothermal development, the Sky Tower, the Westpac Trust Stadium in Wellington and the USAR Specialists’ Response to the Christchurch earthquake. ACENZ chief executive Kieran Shaw says that many engineering projects are the platforms that modern society depends upon but so often takes for granted. Two key roading projects – Waterview in Auckland and Transmission Gully in Wellington – plus the completion of civic and community facilities in Christchurch are key projects in the next five years that will help improve lifestyles for many New Zealanders. The $30.4 million Hatea River Bridge project in Whangarei was recognised for the engineers’ tenacity throughout the design process and close collaboration with architects and builders. It is only New Zealand’s second bridge with a lifting mid-section to enable boats to pass underneath. Judges said the 265-metre bridge exemplifies outstanding civil construction, while showing that good design can include both functionality and aesthetics. 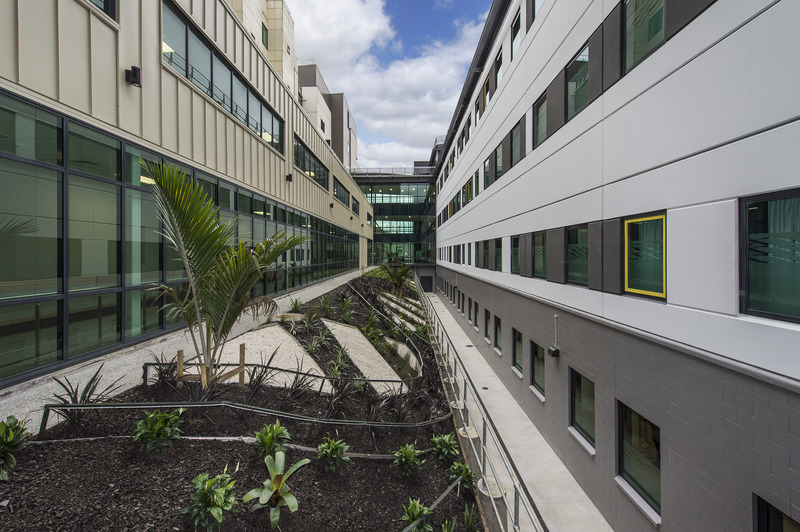 In winning Gold for Manukau DHB’s Harley Gray Building, Beca were praised by Judges for their close collaboration with hospital staff throughout design, and use of energy conserving modelling studies to achieve high energy efficiency. “The $124 million Harley Gray Building at Middlemore hospital provides 14 new, state of the art operating theatre suites and associated clinical services. Designed to the highest possible standards, this new ‘heart of the hospital’ provides space for future expansion. “The facility provides an enhanced experience for the patients, families and staff serving the people of South Auckland. It was completed under budget and ahead of time, providing value for money with innovative, engineering solutions and long-term durability. The third Gold Award went to Dunning Thornton for Wellington’s Clyde Quay Wharf project. This 100 year old, decaying and earthquake prone passenger wharf was successfully converted into a stunning and high-value premium apartment complex with vastly improved public access space. “This exclusive redevelopment is located in an iconic and prominent position on Wellington harbour. The public reaction, values achieved for the apartments, and the technical success of a submerged carpark without a single leak are outstanding,” The ACENZ judges say. Napier, Palmerston North, Warkworth, Auckland, Christchurch and Waikato projects won silver awards. ACENZ members make up around 95 per cent of New Zealand’s consulting engineers and infrastructure design industry, and represent about 10,000 employees. The Association reaches an extensive network across business and industry, and works closely with private and public sector leaders and policy makers. For further information contact ACENZ chief executive Kieran Shaw on 027 457 4303, or Make Lemonade media specialist Kip Brook on 0275 030188.